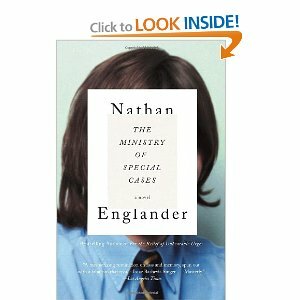 Englander, Nathan. “The Ministry of Special Cases”, Knopf, 2007. Set in 1976, Nathan Englander’s “The Ministry of Special Cases” is a look at the “dirty war” in Argentina. Kaddish Pozan, the son of a “whore” makes a meager living by marring tombstones of Jewish prostitutes and pimps. Their children, who are doing just fine socially and financially, do not want to be reminded that their parents were immigrants or of their shameful occupations. Kaddish works at night in the cemetery while Lillian, his wife, labors at an insurance agency during the day and their son, Pato, goes to college, concerts and smokes marijuana with his amigos. Pato is suddenly taken away ad Kaddish learns what it is to have identity erased. It seems that Pato has been arrested and no one will admit that is the case. In fact, as far as anyone in authority is concerned, there is no proof that Pato even exists. Lillian and Kaddish make preparations to get into the Ministry of Special Cases and it is here that we, the readers, begin a journey into the depths of hell. Rich in imagery and symbolism, “Ministry” is a sheer delight to read. It is a haunting look at the very worst scenarios in an attempt to erase knowledge of the existence of people on earth. Englander’s powerful prose exploring the nature of absence is a revelation. When Kaddish discovers that his son is missing we learn a great deal about the nature of loss and gain an insight into the nature of the government of Argentina when it attempted to purge the country of what it called “desaparecidos”. There are times when the novel takes an absurdist turn and the author’s sense of humor and powerful writing tells of subjects that are almost unbearable with a comic punch. Yet, when we reach the end, we are dealt quite a blow. It is interesting to note that a novel that deals with human absence and government misrule can be as funny as this is. How is it possible for the government of Argentina can erase both the future and the past? At other times the book s horrifying as the obliteration of a culture and families is attempted by a government which seeks absolute power. Englander successfully layers the tradition of the Jewish people with Argentinean obliteration. The juxtaposition of comedy and heartbreak is fascinating and a book that first appears to be quite a simple story deceptively fools the reader—we are not really reading about a lost child but about the loss of an entire community and its faith. As the plot continues to unfold, we are not even sure what disappearance means. There is pathos and ethos in this wonderful book as well as a great deal of knowledge as the novel constantly contradicts itself. Disorientation and oppression are the major themes as a country at war with itself creates havoc among its citizenry.